﻿﻿ Searching For The Perfect Gutter Protection In Westborough? Searching For The Perfect Gutter Protection In Westborough? Here Is Must-Know Information On The Most Popular Types Of Gutter Covers In Westborough, MA. We get some nasty weather in Westborough, MA, so gutter covers are a must for homeowners. But here’s the million-dollar question: Which type of gutter protection is right for your home? The reality is that you have multiple types of gutter protectors to choose from… and some are better than others. With that in mind, let’s look at the pros and cons of four of the most popular types of gutter covers in Westborough, MA. This will help you chose the best gutter protection for YOUR situation. The Rundown: Mesh gutter covers are usually made of metal and contain a bunch of small holes to keep water in and debris out. The Good: Mesh is one of the least expensive types of gutter covers in Westborough, MA. They are also easy to install. The Bad: Mesh gutter covers are flat, so leaves and snow can pile on them easily. You have to clean the excess buildup off of mesh gutter screens regularly, or your gutters will overflow. And since they attach to your roof’s singles, they can blow off more easily than over types of gutter covers. VERDICT: If a cheap, short-term solution is what you’re looking for, mesh screen gutter covers are a decent option. Just be prepared to do A LOT of cleaning and maintenance. The Rundown: A brush gutter filter is just that—a big brush that’s installed in your gutters to collect debris. The Good: Brush covers do a pretty good job of catching debris. They also tend to last longer than mesh screen systems. The Bad: Some of the debris the brush catches gets stuck in the bristles, so you’ll have to clean the system regularly. And because of the space between the bristles, the occasional debris does penetrate it and wind up in your gutters. VERDICT: Brush gutter protection performs decently for the price. But when it comes to gutter covers in Westborough, MA, you have better options. The Rundown: Single-drop gutter covers are basically a sloped helmet on your gutters. They curve inward on one side and rely on water tension to make rain flow into the gutters. The Good: Single-drop systems keep out debris very well. Their sloped nature allows debris and snow to fall right off, so you won’t need to climb a ladder to clean them off regularly. The Bad: Since single-drop systems have just one opening for water to get through to your gutters, they don’t functional as well during torrential rain. And when it comes to gutter covers in Westborough, MA, you need a system that can handle the heaviest downpours. VERDICT: If the area you live in doesn’t experience heavy rain, single-drop gutter covers can be a good choice. The Rundown: Double-drop gutter covers rely on water tension like single-drop systems do. The difference is that double-drop systems have two spaces instead of one for water to flow. The Good: Two spaces for water flow mean that double-drop covers direct rain into your gutters much better than single-drop systems. If the water escapes the first curve, then the second curve catches it. 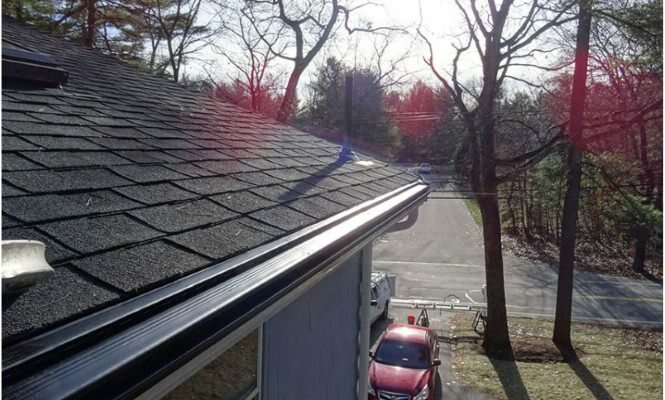 The Bad: Double-drop gutters are a little more expensive than other gutter covers in Westborough, MA. VERDICT: Double-drop gutter covers do the best job of keeping out debris and letting water in. Because double-drop systems perform so well and last so long, most homeowners find the slightly higher up-front investment worth it. If you’re looking for gutter covers in Westborough, MA, and you can’t decide on the right system, contact us today for more information. We would love to help you make the best decision for your home and budget.